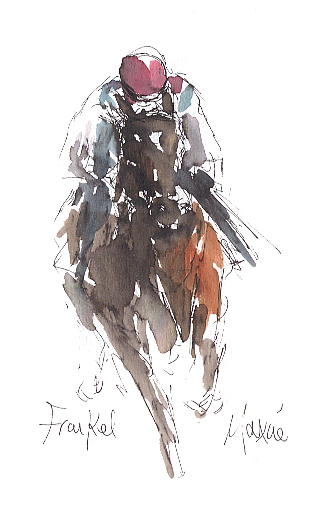 Maxine Dodd grew up in Leicester with a strong desire to draw and paint. She trained initially as a painter, studying Fine Art BA at Liverpool University and specialising in oils. In the 1990s she spent time in the IT industry and was employed by companies to teach their staff word processing, graphics and desktop publishing. This experience was invaluable when she took her first studio in 2006 and then developed her website called, ‘Racing Lines’ in 2012. 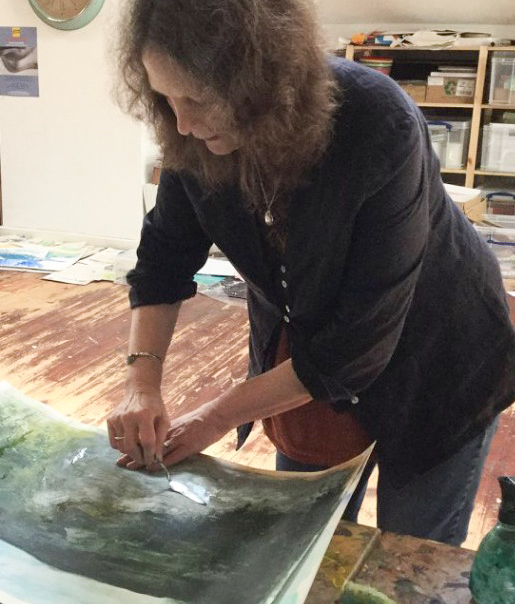 She teaches art and painting to adults, leading classes and talks for local groups. 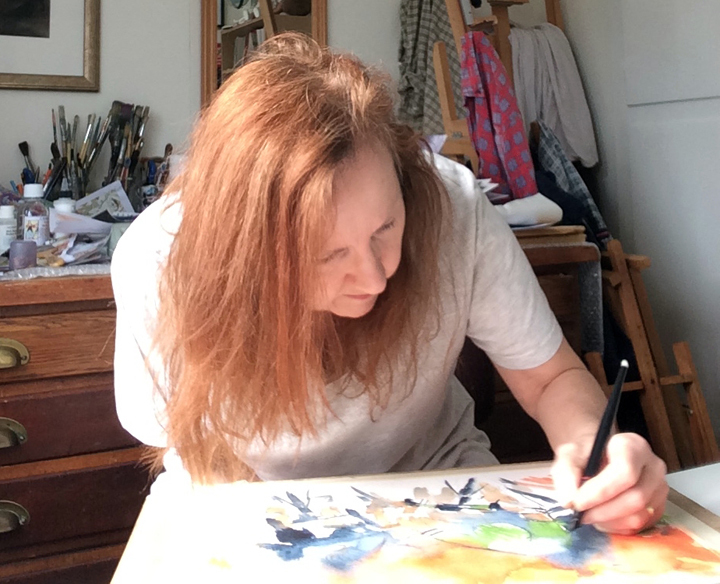 She lives and works in a village near Market Harborough recently she has turned to pen, ink and watercolour to explore her favourite theme of movement. 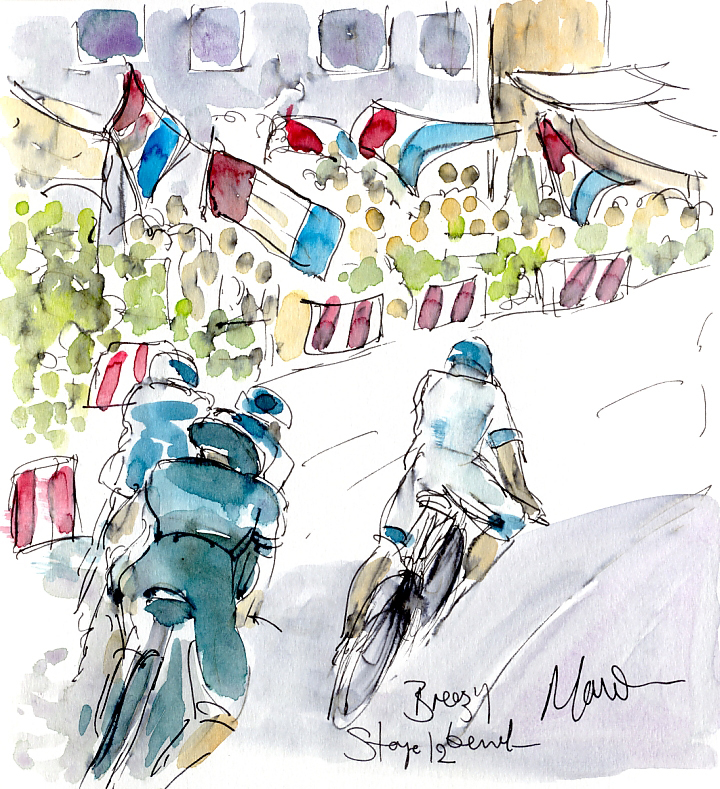 Her love of sport has been the driving interest in her current work, with a collection of cycling pictures on show in Cank Street Gallery from 15 January 2018. I often like to work at night or very early in the morning in summertime, so my little bedroom studio overlooking the garden is always open. I am a practising artist but also since 2009, primary carer for my mother who lives with us, therefore, my work and her care fit around each other. I grew up in a family that loved music and sport, perhaps more as fans than practitioners, but we followed sport and sporting events of all kinds, loved music and I danced a lot. I became aware of the Tour de France at college and have become increasingly fascinated by that race and the whole sport of endurance road cycling. I also love bikes as objects. To me, they are intrinsically beautiful – However, I am the worst cyclist going! 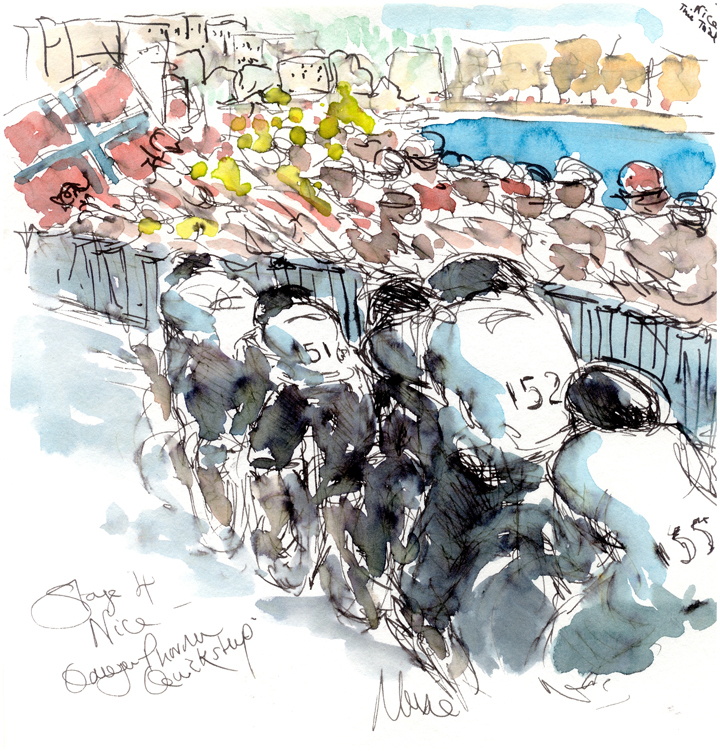 I had the opportunity to watch the Tour de France in 2012 and decided to try and draw it as a subject for an online blog. I enjoyed it so much that my whole artistic direction changed and it still excites me 5 years on. 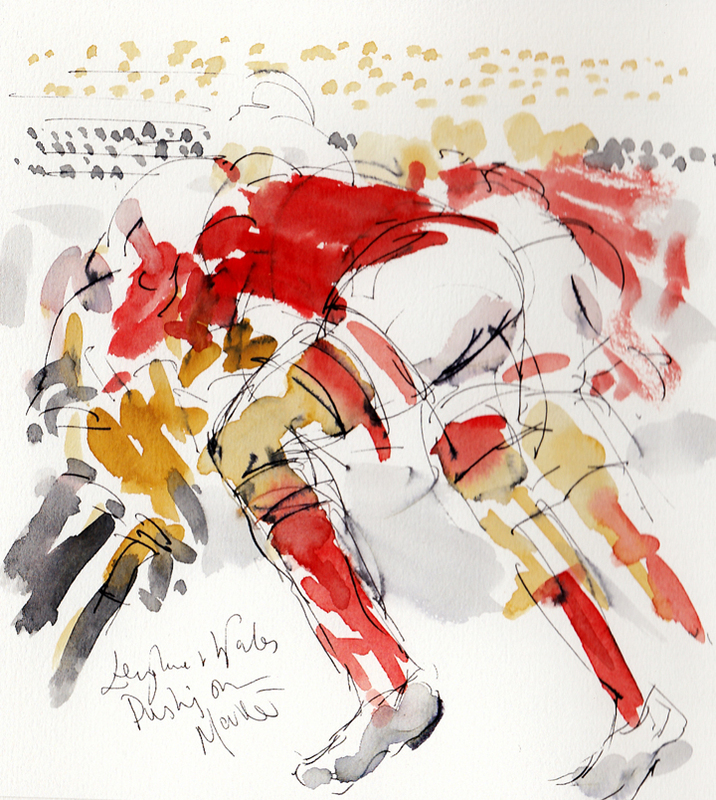 I trained as a painter but nowadays I really think of my work in terms of drawing – even if it’s with a brush and colour – it’s the drawing that excites me, finding the line…. Pen and ink is my absolute favourite – Rotring artpens are just wonderful! 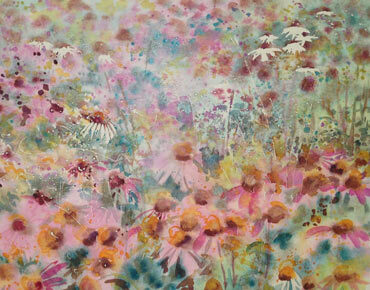 Schminke watercolour and pastels - with Sennelier if feeling lavish! Dealing with interruptions - phones, buzzers emails, even my own thoughts sometimes. I listen sports commentary on Radio 5 Live as a background to working, particularly at the weekends - races, cricket, they all have rhythms and there are always surprises too. 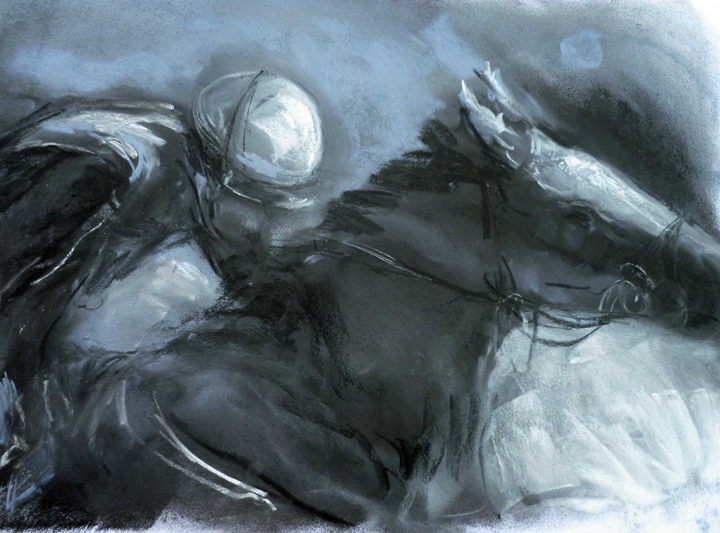 Depicting movement with graceful lines; the ‘line’ is essential – Seeing where action and breaks in action are balanced. I think a great deal about the ‘white’ space – where the paper does its work. When the pen line flows. 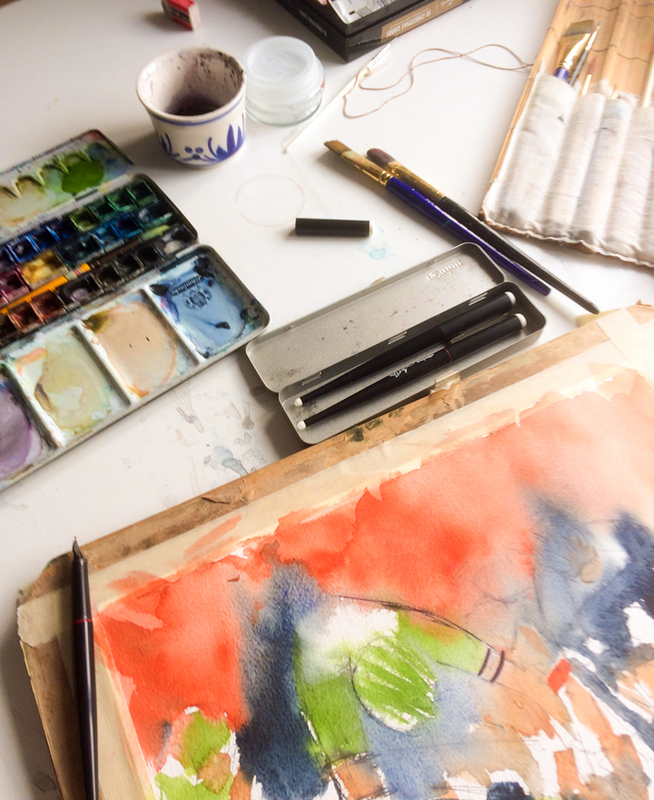 There are times when the action feels almost effortless and all I can hear is the scratch of the pen on the paper and the splash of the water in the pot – I love that so much – nothing beats it! I was very fortunate to have a studio for a number of years at Barton Hall in Kettering. This beautiful house and gardens were opened up to artists by the Wicksteed Trust and it gave all of us a wonderful chance to work, interact with each other and most importantly, engage with the public. 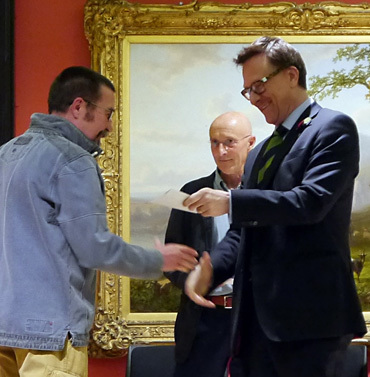 It opened up all sorts of opportunities and helped me to establish myself as a professional artist. My work at that time was inspired by landscape and nature and mostly quite large paintings in oil, acrylic and pastel, working from photographs and sketches. The change to my subject matter came about through a couple of projects that I accepted. The first was at a primary school in Leicester, where the brief was to capture dance workshops for children with special needs - without using a camera. 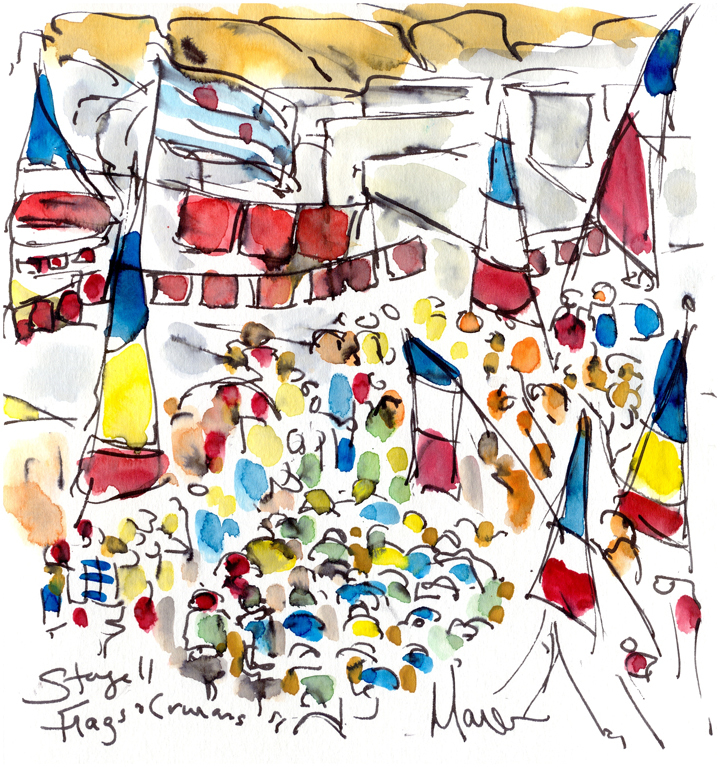 I worked with felt tip pen and water soluble crayons to quickly capture the workshops, with the children dancing, using colourful equipment to show how the classes helped them develop communication and freedom of expression. It was so exciting to be a part of the project and it is still a great highlight and was a turning point for me, to capture active subjects as they were in motion. 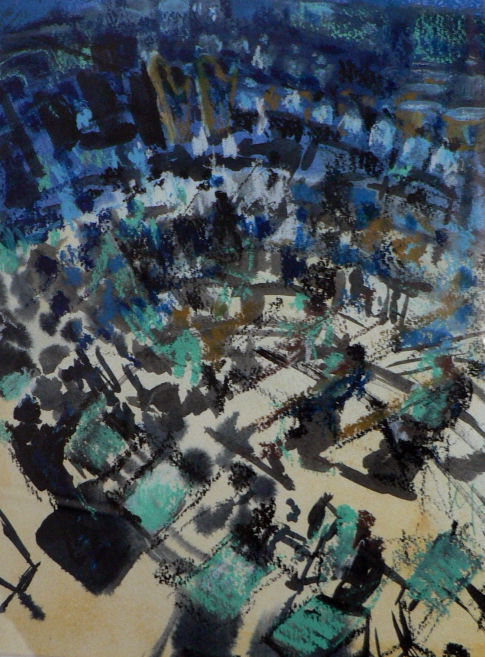 Around the same time, I had a similar opportunity to draw the Kettering Symphony Orchestra in rehearsal. Once more, I found the activity of drawing from moving action extremely inspiring. 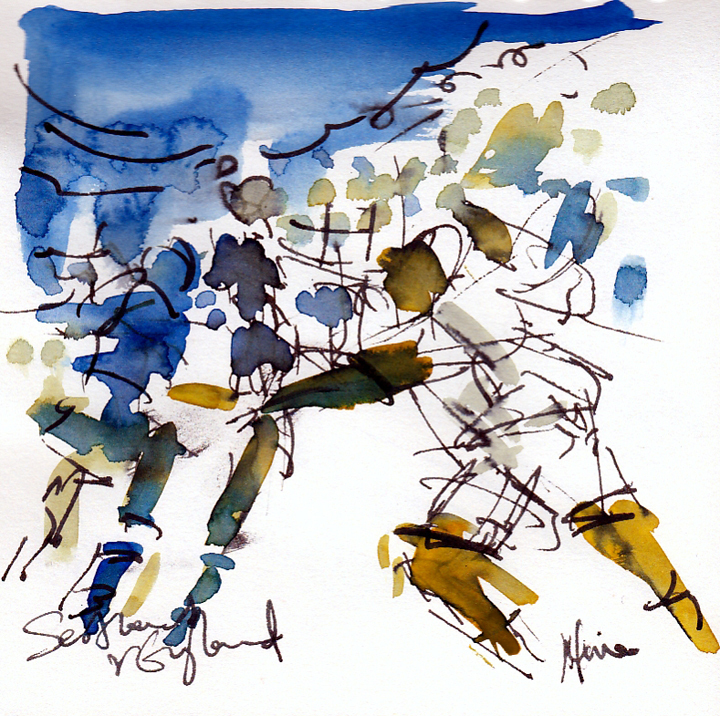 I came back to using pen and ink and working on a smaller scale which was easy to set up. I was able in both cases to disappear into the background while they worked. The school and orchestra projects were lovely to be part of. Barton Hall changed hands around 2011 and became a beautiful hotel, so the artists were dispersed. I came back to work from my studio at home. In 2012 I was looking for new ways to connect with people and I started up a blog. I have found this extremely satisfying, with reactions and comments and and buyers for my work coming from USA, Canada, Switzerland and France, as well as at home in the UK. Are there any special moments in your artistic career? I remember the first time I discovered how to highlight an eye with a dot of white, drawing pastel on black paper at school, I loved the contrast and the way that the pastel lights up. I still do love that! 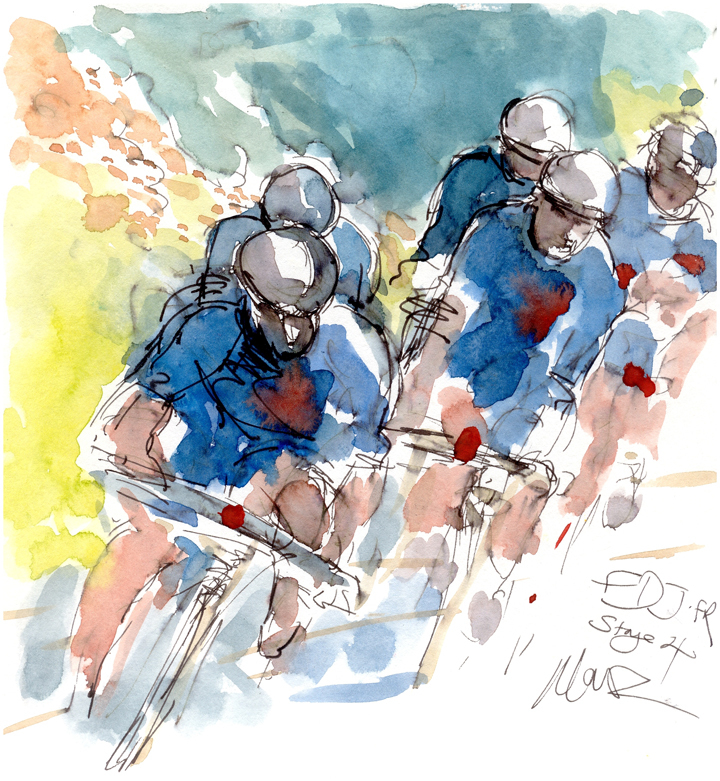 Becoming part of the ‘velo’ arts scene – art and cycling - has been an inspiration, and finding my new artistic direction in sport and movement. Coffee in the morning, tea in the afternoon, Red or white in the evening! iPhone . . . . or ancient laptop! Early morning – very early sometimes! FAVOURITE THINGS . . .
Earth Wind and Fire – their music heals and I just have to dance! Frank Sinatra singing ‘The best is yet to come’ 1959, (Coleman and Leigh, 1959) - it's optimistic, witty and the orchestra is fantastic. Leonardo da Vinci, Barbara Hepworth, Raoul Dufy, René Gruau - I know, that’s four! 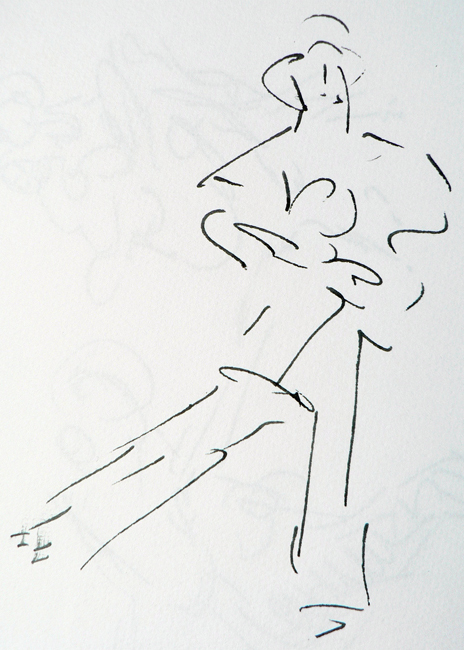 Gorgeous drawings and beautiful lines in the work of all of them, so elegant! 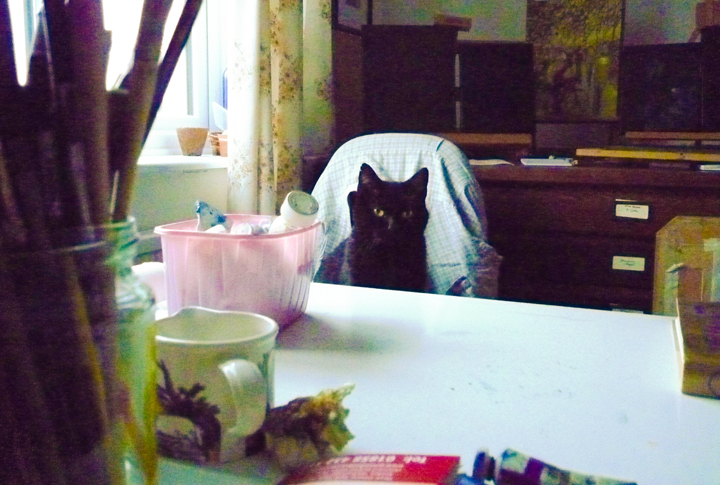 and here is my Studio Assistant. 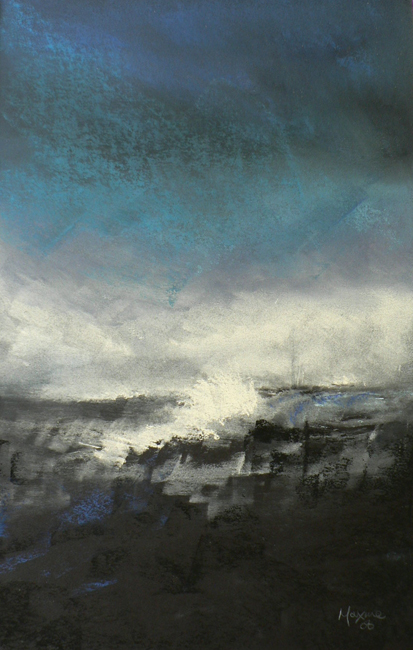 See an exhibition of paintings by Maxine Dodd at Cank Street Gallery from Monday 15 January.